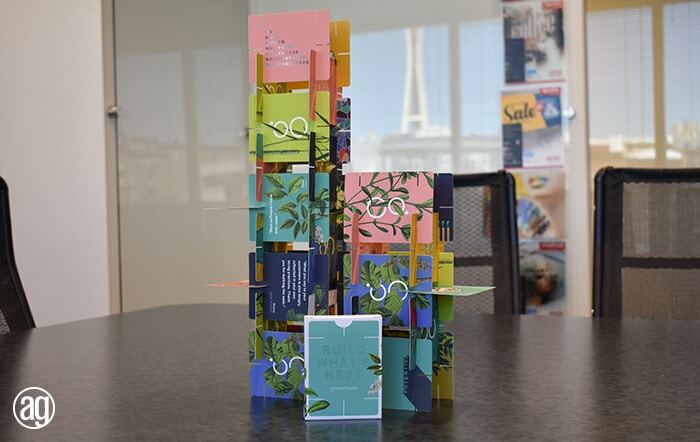 Not all internal business marketing collateral needs to be boring. 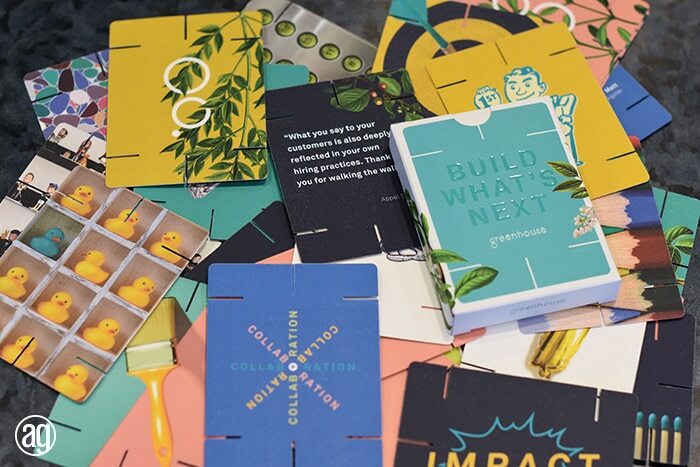 An effective piece will communicate your company’s message and connect with your audience. 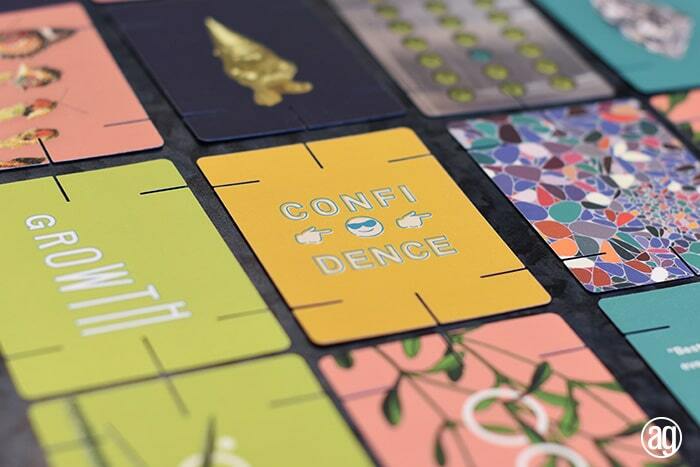 The level of engagement is a key factor in determining the success of your project. 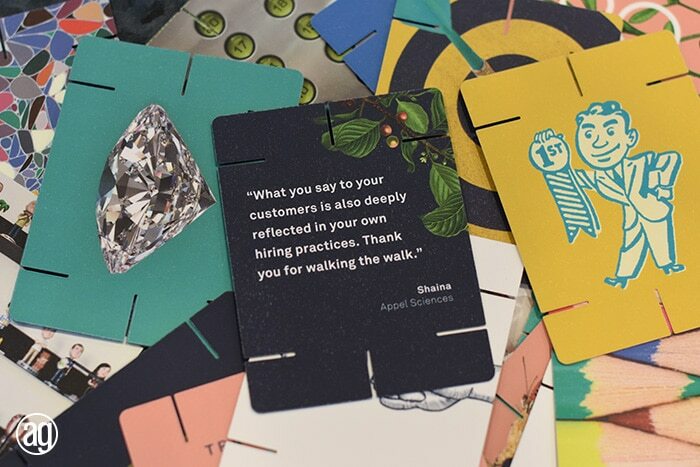 More times than not, a high level of engagement equals a high level of success. 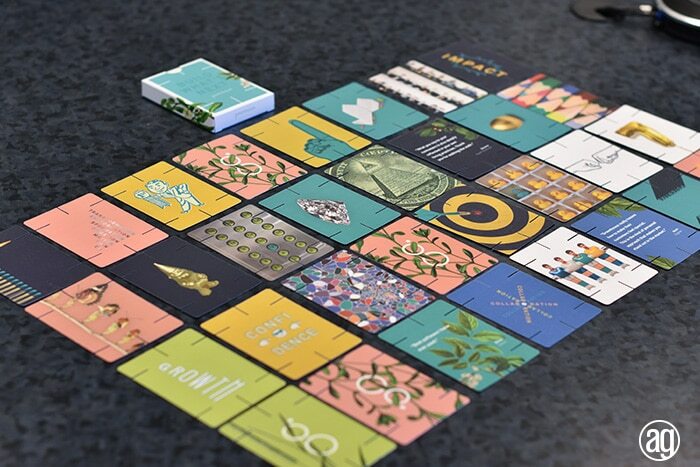 We recently produced a marketing project for Bread N Butter that got everything right. 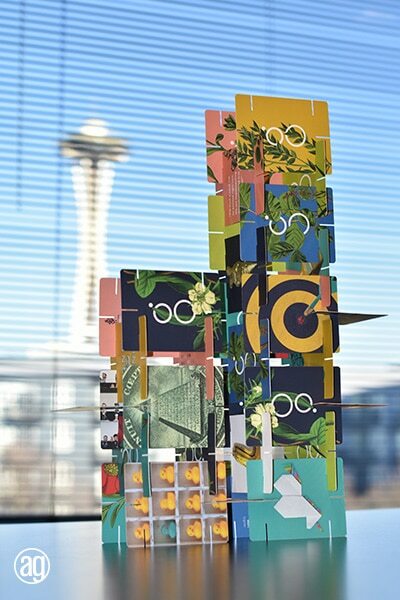 Bread N Butter is a creative design agency based in Seattle. 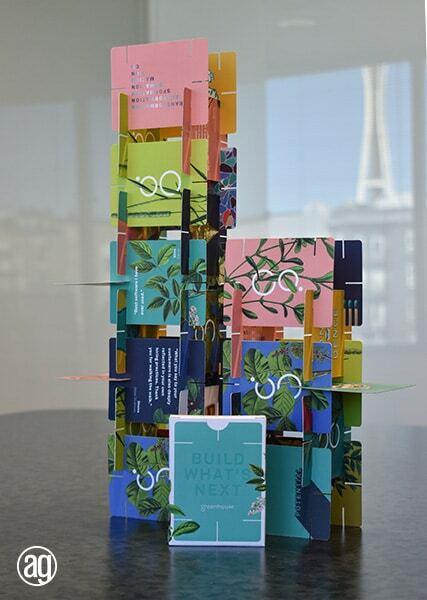 They specialize in building powerful brand experiences. 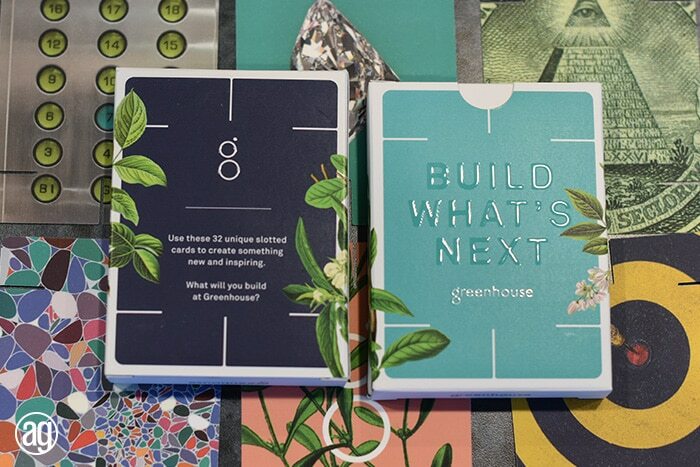 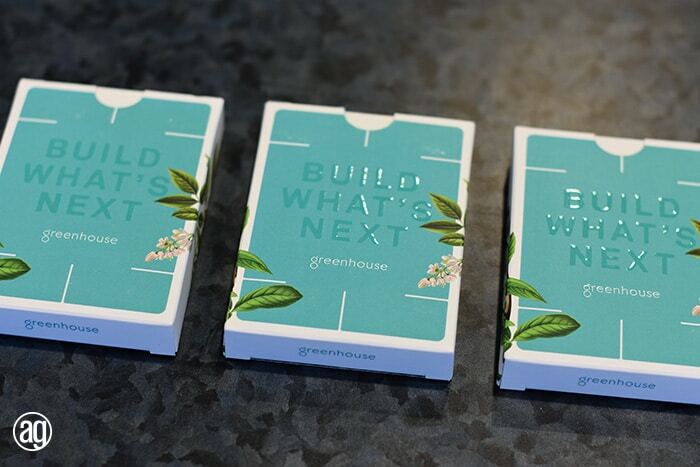 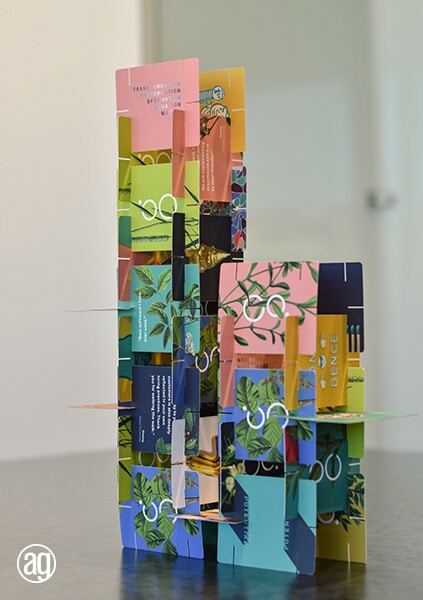 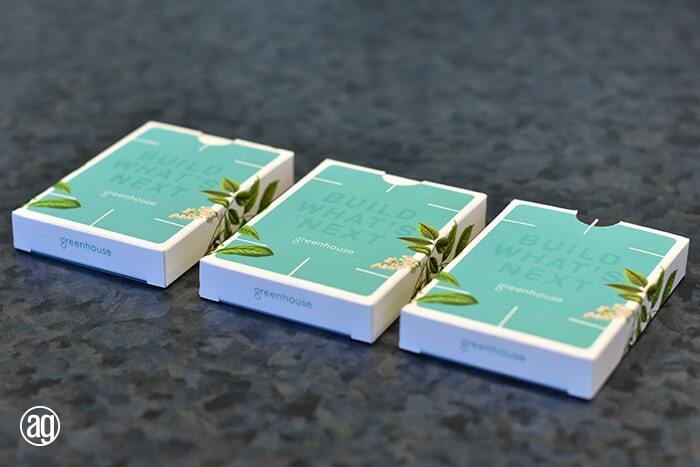 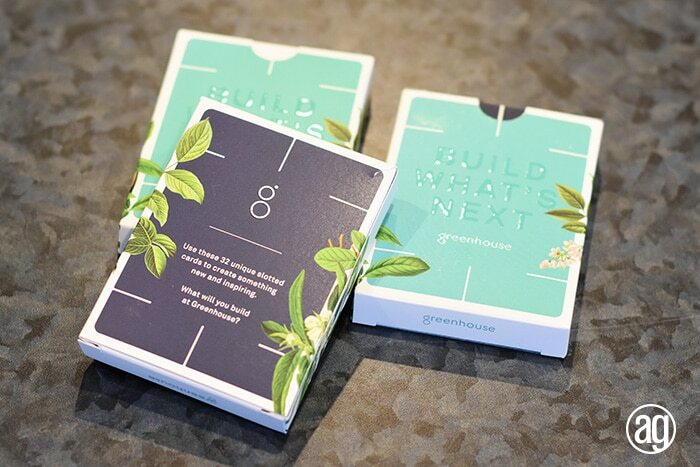 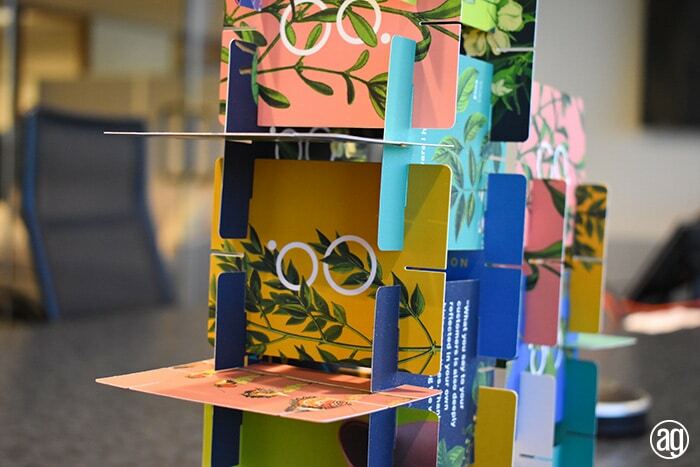 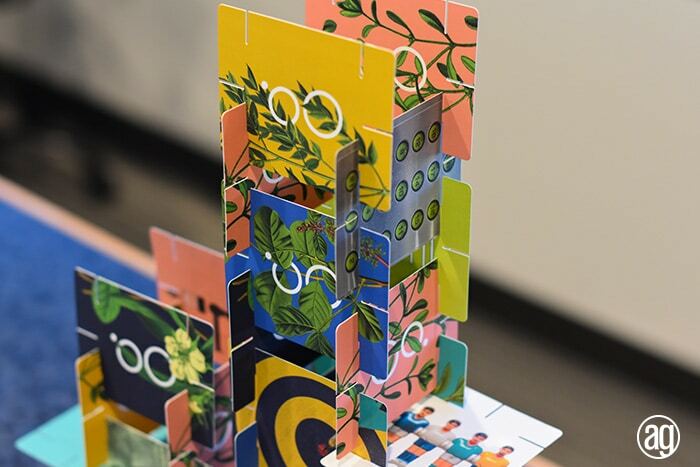 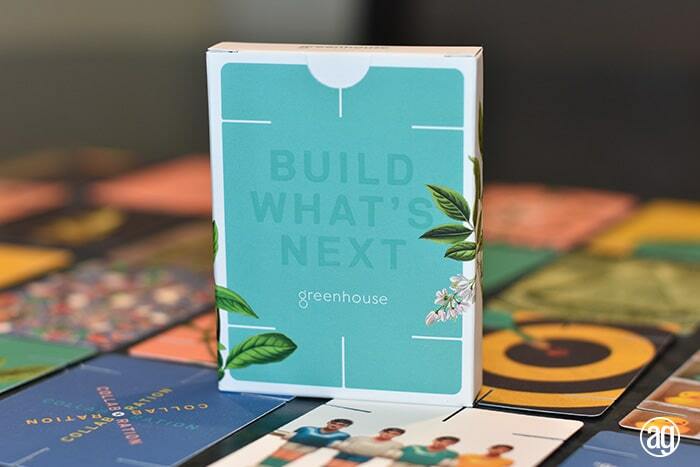 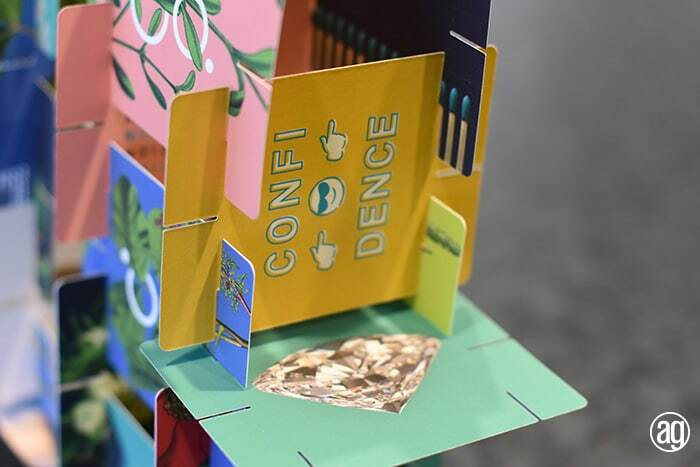 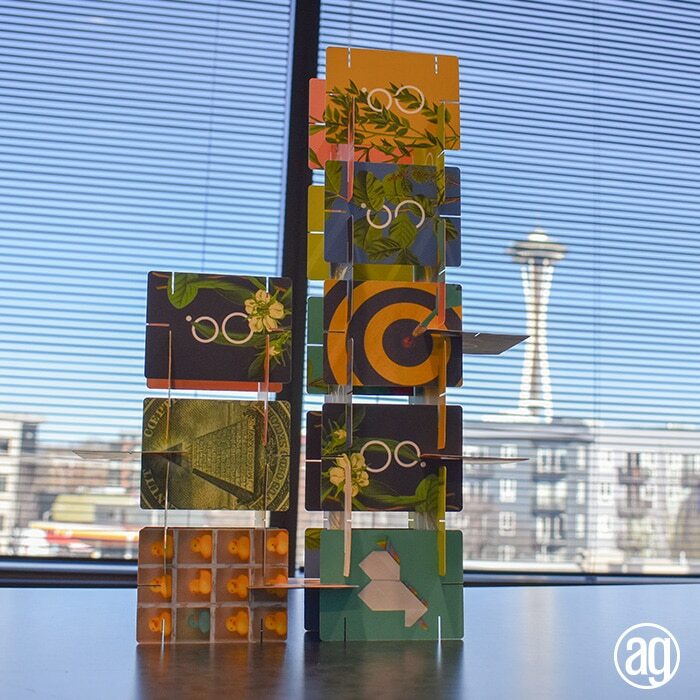 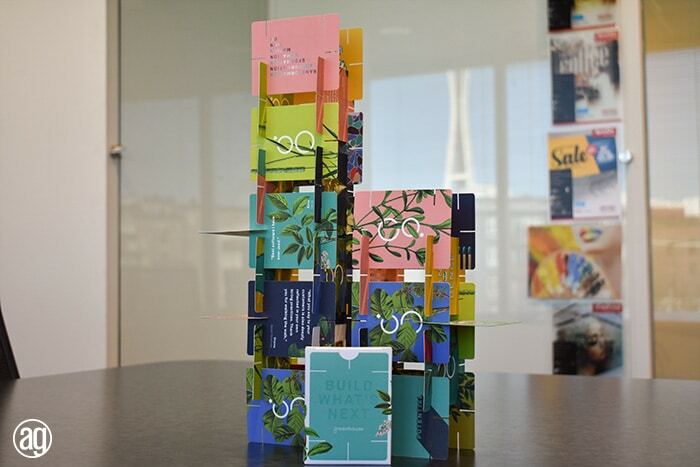 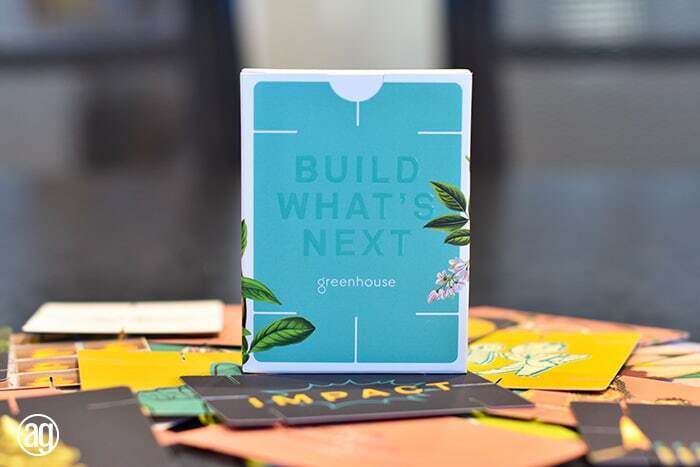 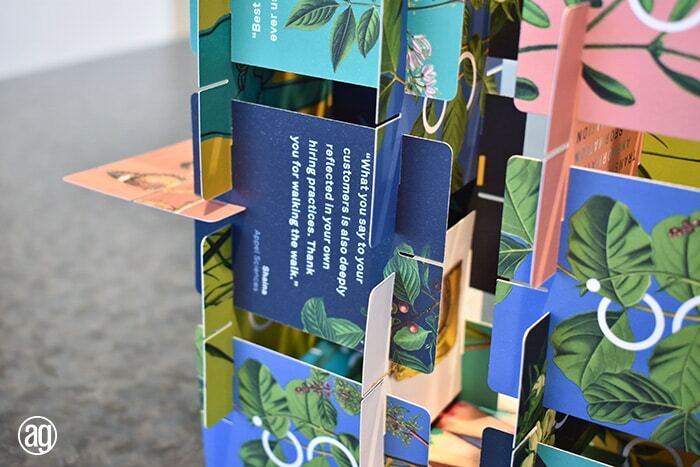 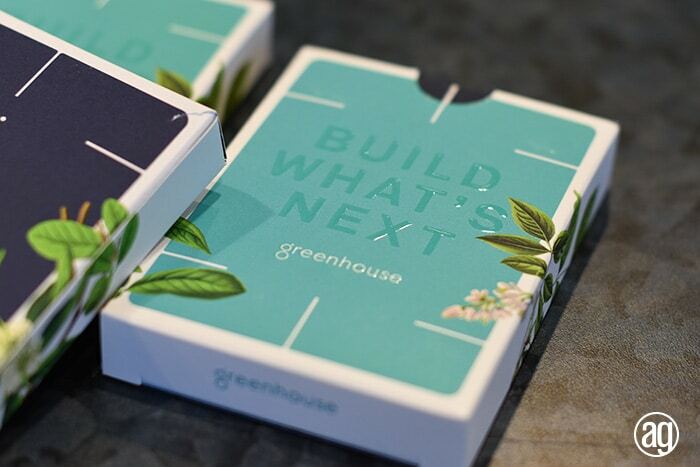 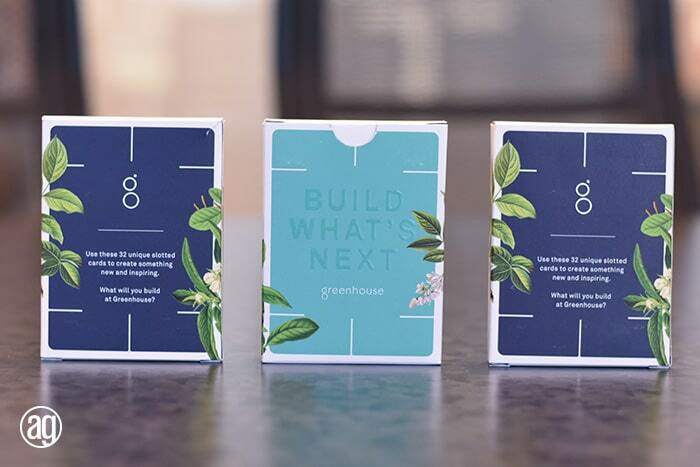 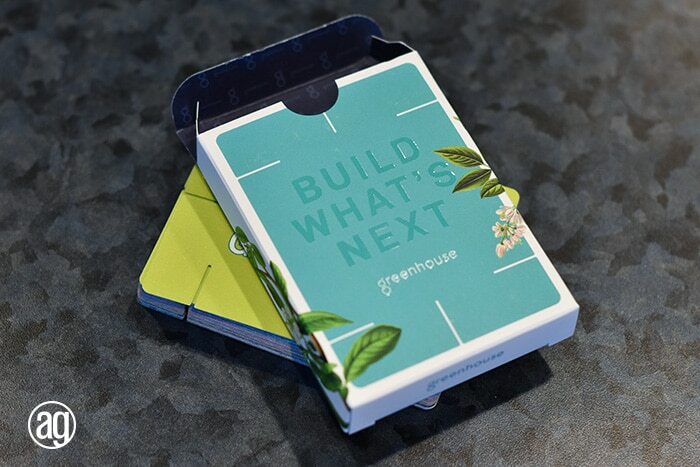 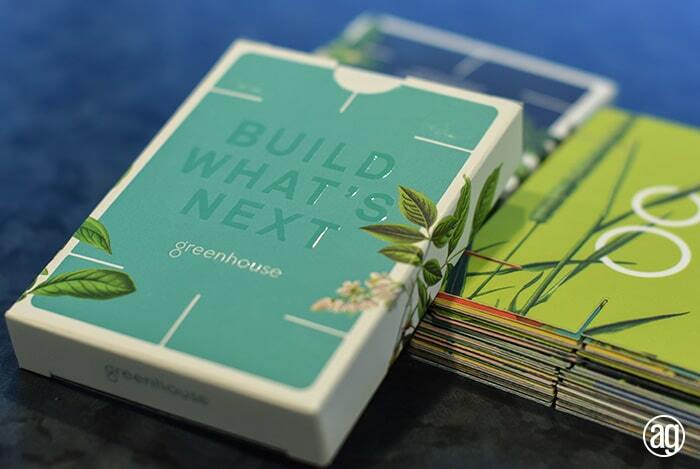 They designed a deck of “stackable cards” for their client, Greenhouse (a talent acquisition software development company), to be used in part with their internal team building and onboarding efforts. 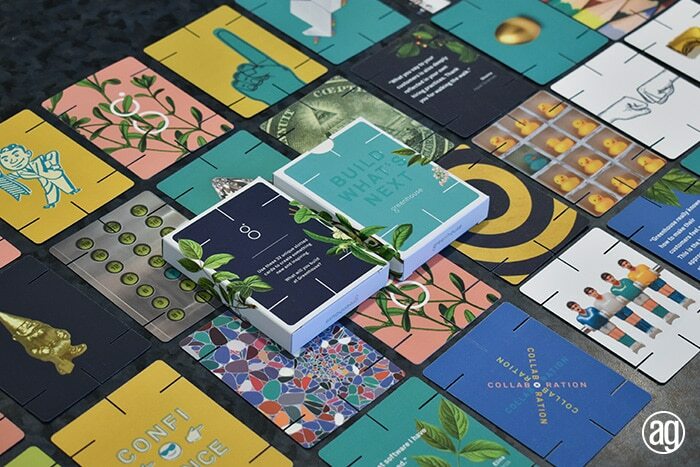 Bread N Butter developed the project concept and artwork, and we produced the cards. 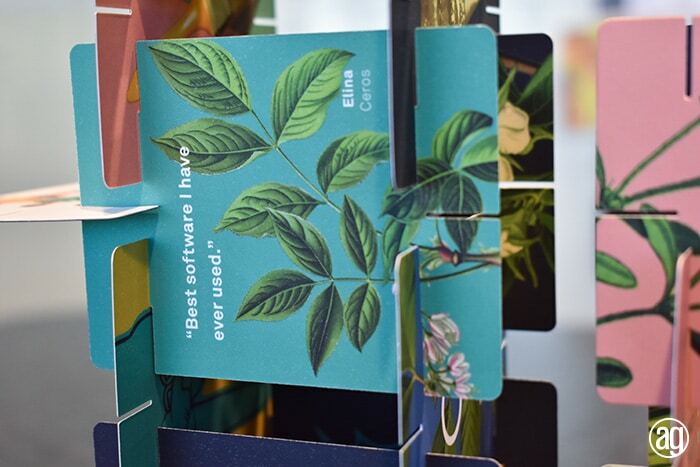 The cards are stackable. 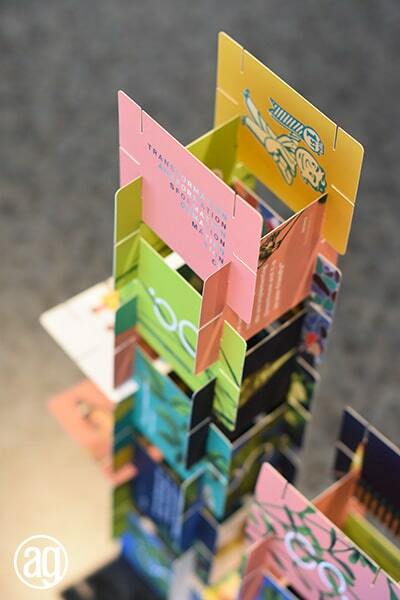 They have six slots around the edges that allow the cards to seamlessly connect together. 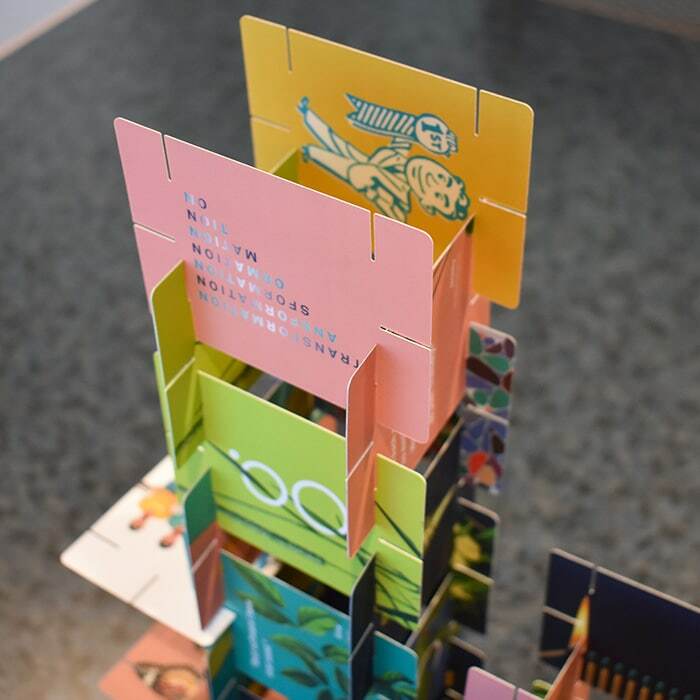 People can use the cards to build a unique structure. 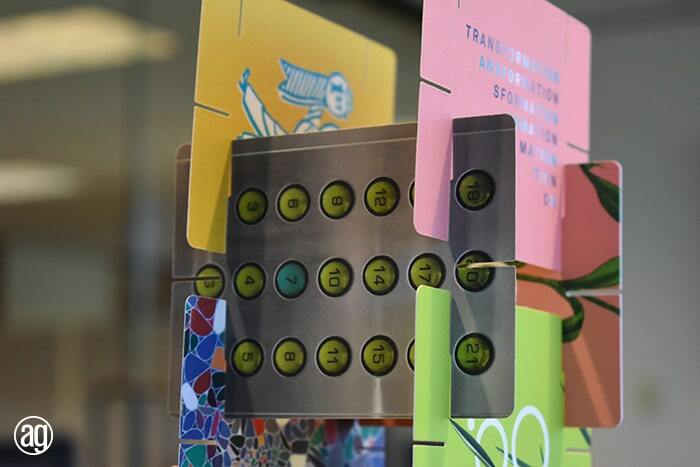 Thus creating a fun, interactive experience. 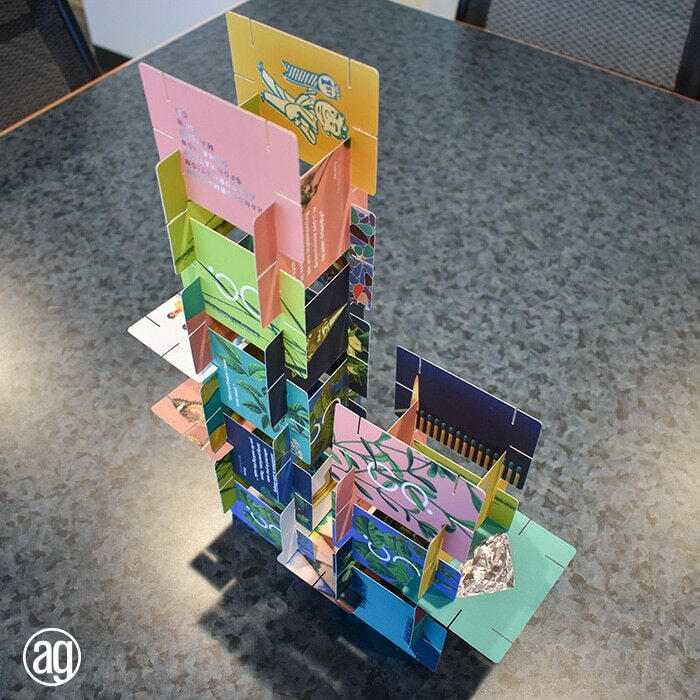 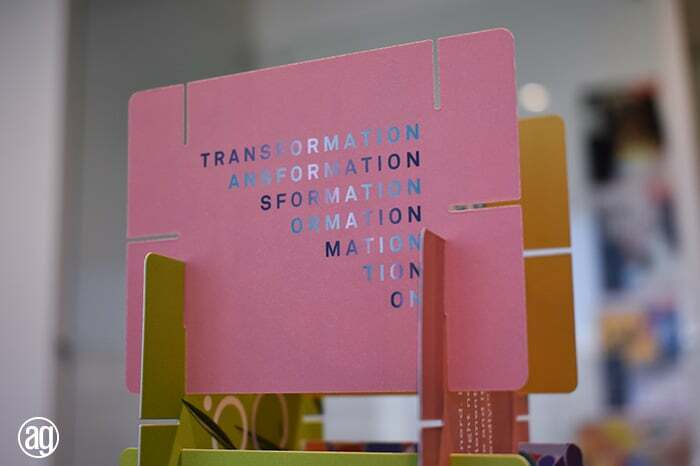 The artwork concept is based around themes of “team building” and “growth”. 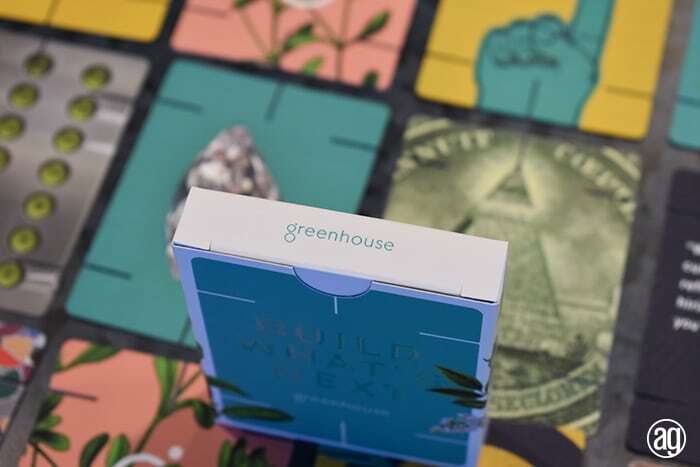 It is playful and fun and it aligns perfectly with the Greenhouse brand. 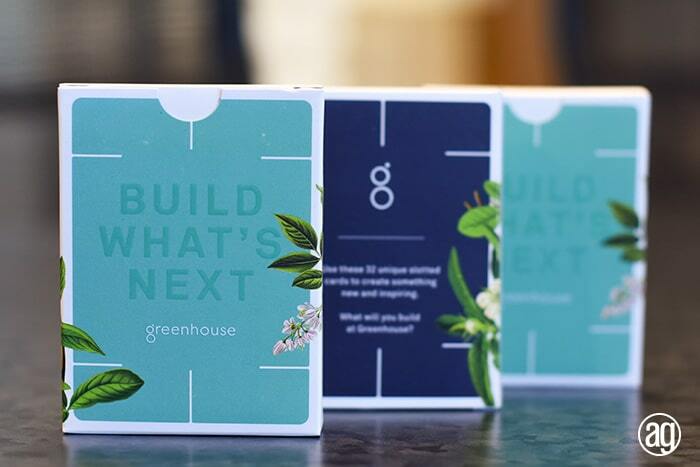 The Greenhouse logo is prominently featured on the cards. 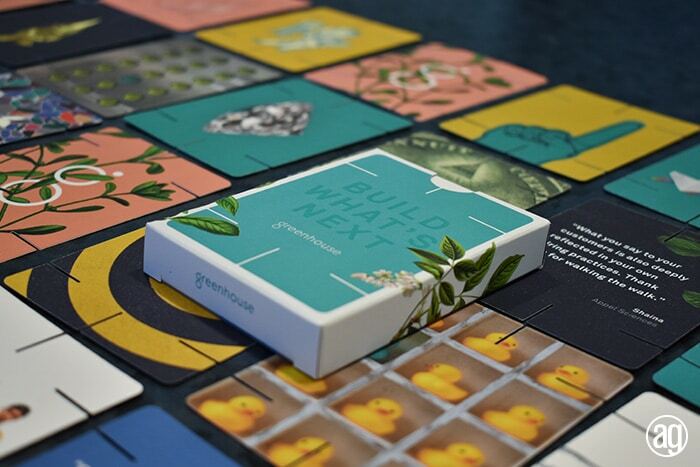 There are two parts to this card deck project. 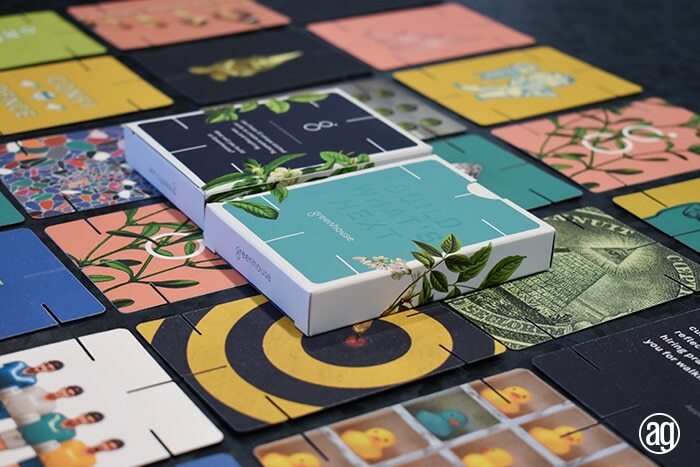 The individual cards (32 cards per set) and the outer box. 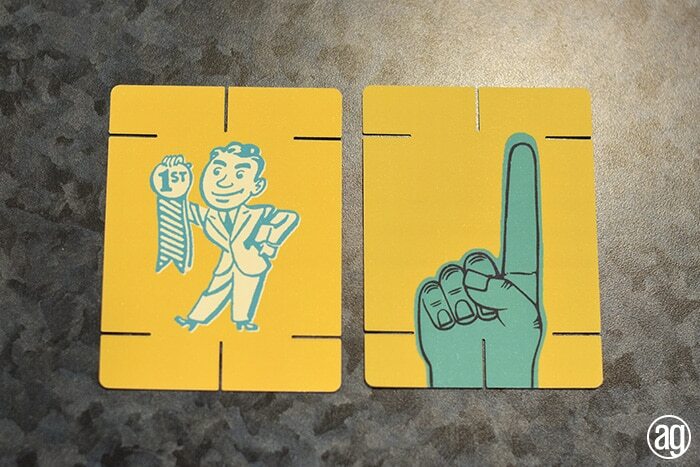 The die cut cards are 4” x 3” in size. 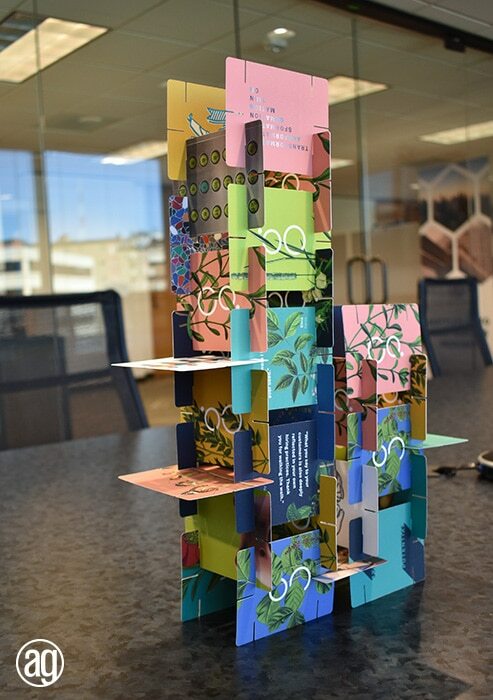 They are printed digitally on our Indigo press and are coated with a soft touch laminate. 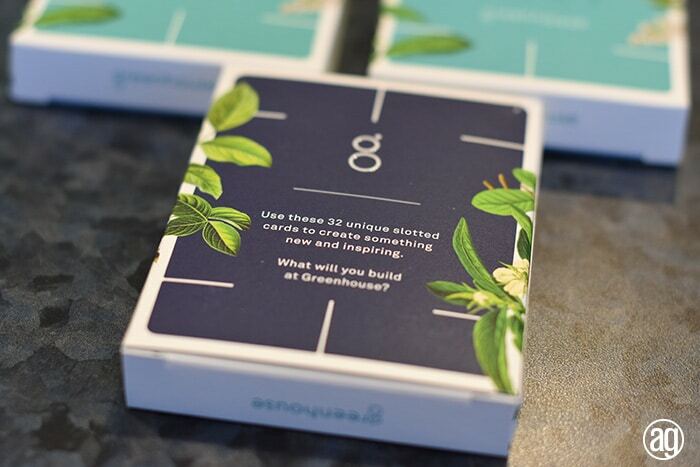 The set of 32 cards fit snugly inside the box. 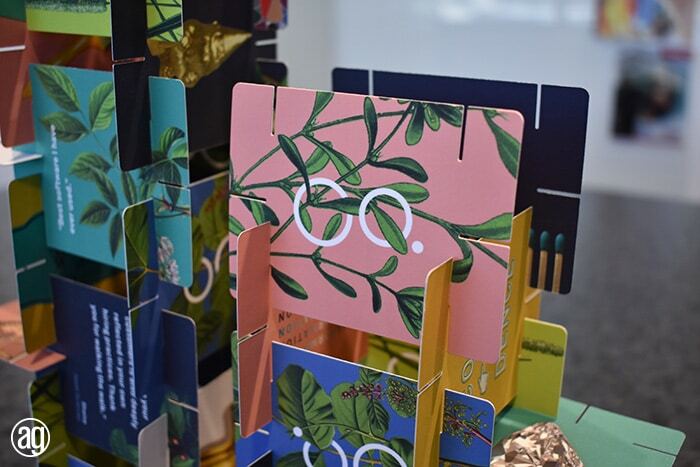 Like the cards, the box is digitally printed on the Indigo and is finished with a soft touch laminate. 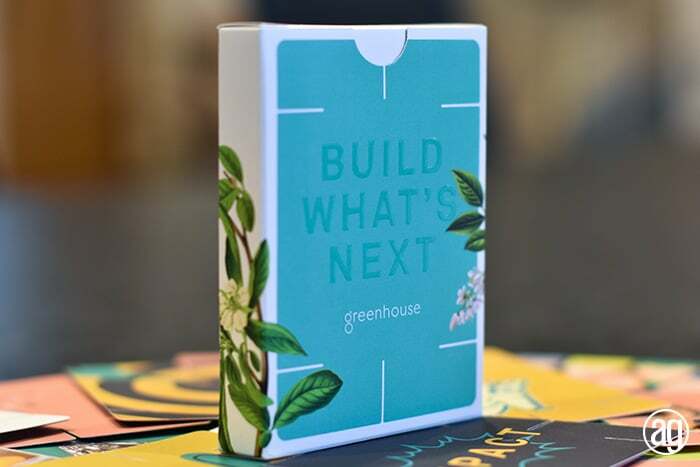 Additionally, the text on the front of the box “Build What’s Next” is enhanced with a digital raised spot gloss from our Scodix press. 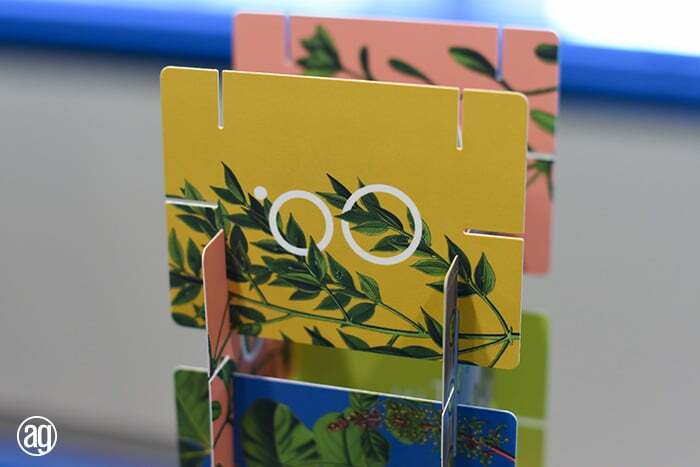 We produced a total of 500 sets. 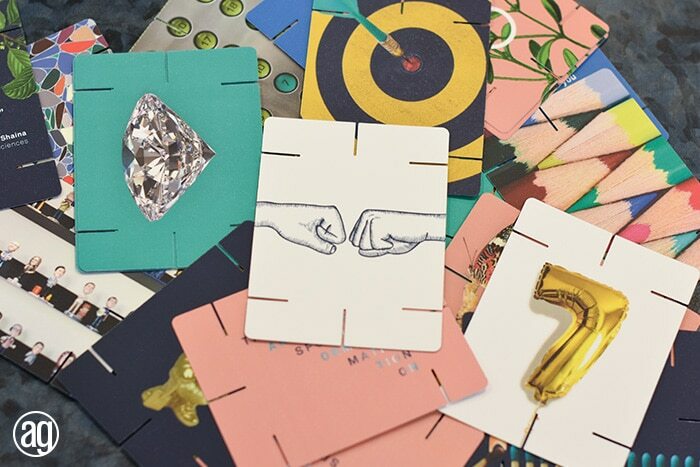 By all accounts, the project was a huge success.